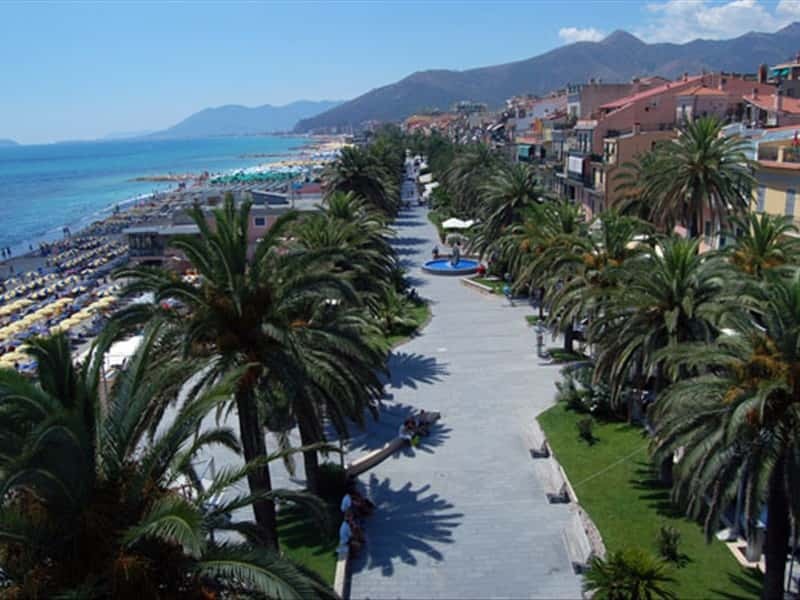 Town in the province of Savona on the Italian Riviera between Pietra Ligure and Borghetto Santo Spirito, Loano is known for being the birthplace of Garibaldi's mother, Rosa Raimondi. The discovery of artifacts dating back to prehistoric times and pre-Roman ages, show that the area was already inhabited in ancient times. In Roman times numerous villas were built near Loano, as evidenced by the findings traced here, including a mosaic which dates back to the Imperial period. In the VIII century the town was part of the feud of the Benedictines and in the XII century it was dominated by the bishops of Albenga. In 1263 it was purchased by the Doria Family, that convinced the inhabitants to move nearer to the coast and since then, it was under their rule until 1770, except for a brief period in the XVI century when the center was sold to Fieschi. The Doria were responsible for the construction of important churches and buildings, the pride of Loano. It passed to the Republic of Genoa and happily followed its fortunes. This area was also the scenario of the first clash between the French and the Austro-Sardinian. The Monastery and the complex of the Convent of Mount Carmelo in the early XVII century. It features a Latin cross shaped church, which houses paintings of the XVI and XVII centuries, the cloister, the convent built by the Doria, the tower of defense and the Prince's palace. The Cathedral, built in 1600 by the Doria, which preserves paintings of the XVII century. The Church entitled to St. John the Baptist, built in 1262, and retains the ashes of St. John the Baptist and other martyrs. The complex includes the church of St. Augustine and the cloister built in the XVI century. Convent and Church of the Capuchins. The Church of Our Lady of Loreto. Palazzo Doria, built in the XVI century is today the seat of the Town Hall. It features a wonderful slate portal of the XVI century and a mosaic floor of the III century A.D.
A pentagonal tower built in 1602 and connects by a walkway to the Palazzo Doria. The castle, built by the bishops of Albenga in the Middle Ages and refurbished by the Doria in the early XVII century. The gateway of Passorino, main entrance to the historical center. The Palace of the Commander of 1606. This town web page has been visited 19,171 times.